I'm home, but I've been busy! The kids went back to school yesterday, so I had to start getting them ready right when we got back on Saturday. Hopefully, I will have some stitching to share soon! Your boys are so cute and spiffy looking for school! It's good that you take those first day of school pics. I often forgot to, although I did take a few. Glad you're back and getting back into the ole routine! Your boys are adorable. Glad you enjoyed NYC. I agree it's always nice to get back into a routine and your own bed. What grade are your boys going into? What cute kids! Looks like they're ready for the new school year! what a sweet pic? do the kids out there wear uniforms? here some do some don't. my kids don't. Nicole, your boys are just so cute, what handsome bunch of guys you got there. Welcome home, I am glad you are home safe and sound and happy you had such a nice trip too. Good luck to the boys back to school. The boys are darling!! Sounds like you had a wonderful vacation! Handsome boys, they look so adorable. Hope they are enjoying school. Welcome back! They are so handsome :-). It looks like you DID take the circle line tour! (If memory serves) I just love doing that--I need to go ride the ferry again before the weather gets too cold. Your boys are SO adorable, Nicole. I hope they have a wonderful year at school! Golly, those boys are too cute for words. Some teachers are gonna be so happy to see them walking in the door. Welcome back! Can't wait to watch your stitching progress again. Your sons have gotten so big. Good luck to them this school year! Welcome back, Nicole! Looks like a fun time was had and lovely weather while you were away. 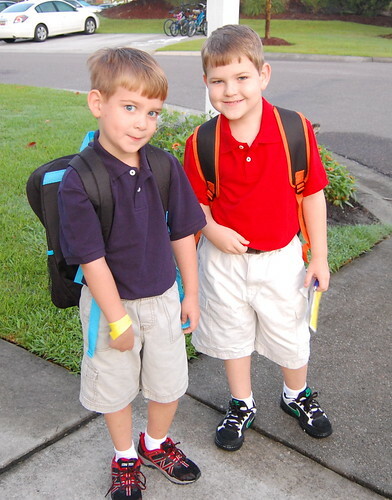 What a terrific picture of your boys ready for school too. A nice keepsake for future. They're adorable - very proud you must be. I haven't had a chance to look at your NY pictures (will do that next), but I just had to say - your boys are so cute! Those are some handsome sons you have there! Your boys are soooo cute!! A photo to treasure for sure. Welcome back! Welcome Back! Hope you all had a great vacation and the boys had a great first day back to school too. your boys are so handsome Nicole! Little boys hold a special place in my heart! Best of luck with the start of school! Awww that picture is adorable! Your boys are so cute. Pleased to meet you. Se you soon!